A huge thanks to everyone who attended the launch on Wednesday which was a brilliant afternoon. The sun shone, and the artworks, especially the classroom mosaic looked resplendant, and the wildflowers, boosted by the recent rain added a splash of colour to the proceedings. 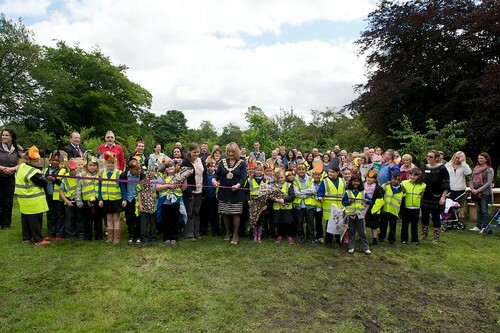 70 children from local schools, Oakdale and Flowery Field, enjoyed creative activities and tours of the orchard. They also brought hats, poems and pictures they had made especially for the day. 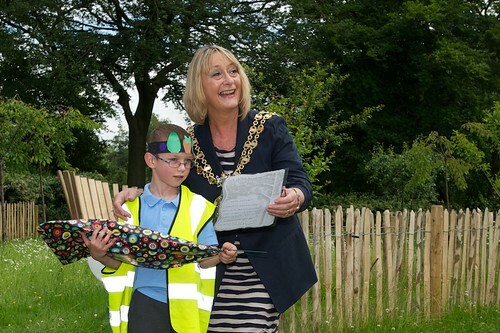 Prizes for these were awarded by Mayor Brenda Warrington who kindly attended to open the orchard. Well done to all the children involved. Oakdale School also produced a beautiful banner to commemorate the day. As ever the Park Cafe provided delicious refreshments and thanks to all the trainees, staff and volunteers who helped out on the day. 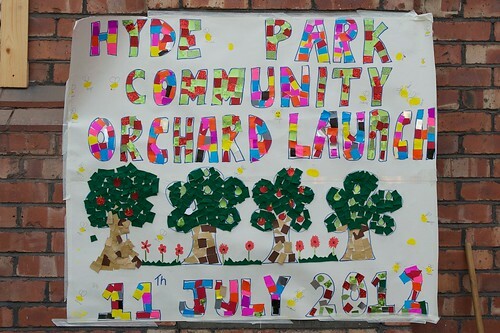 Thanks again to the Groundwork UK and Big Lottery Fund’s Community Spaces programme for making this possible, and to Hyde District Assembly as well for their support.